After the recent mini meringue burgers aka macarons, it seems we have a theme going here with this week’s mini vanilla creme corn dogs. I never thought I would compare delicate French pastries to American fast food favorites, but the resemblance really is uncanny. And while this humble attempt at imitating the timeless French classic surely doesn’t do justice to the real deal, I was yet again surprised at how relatively simple it was to recreate my favorite French pâte. That said, it was much easier working as a duo — special thanks to my bold baking warrior buddy Tim V! — and I highly recommend trying this recipe with a friend. I also highly recommend springing for a pastry bag. We rigged a DIY situation with a plastic baggie, which seemed like a great idea till it erupted vanilla creme filling everywhere. The moral of this week’s baking fable is that there is something really empowering about baking a favorite dessert that you always figured required really complex baking ninja skills, especially when it’s a French dessert. The end product may not be as pristine and photogenic as the dainty, doily’d delicacies behind the counters of Parisien pâtisseries, but that doesn’t take away from the satisfaction of accomplishing such a daring feat. Ah the sweet, sweet taste of a kitchen victory. Makes about a dozen 4-5 inch eclairs. Special tools: pastry bag. Add milk to a medium saucepan. Split the vanilla bean lengthwise in half and scrape out the seeds into the saucepan. Add the vanilla bean. Bring to a boil over medium heat. Remove from the heat and let infuse for 10 minutes. Meanwhile, combine the sugar and cornstarch in a medium bowl. Add the egg yolks. Whisk just until the sugar dissolves; do not let the mixture become pale. Return the milk to the heat and bring to a boil. Whisk one-third of the milk into the egg yolk-cornstarch-sugar mixture. Whisk in the remaining milk. Return the mixture to the saucepan, straining it through a fine sieve, and cook over medium heat, whisking constantly. As soon as the pastry begins to thicken, remove it from the heat. Whisk in the butter until smooth. Scrape the pastry cream onto the prepared baking sheet and wrap it in the plastic, pressing out all the air. Place in the fridge to chill completely. 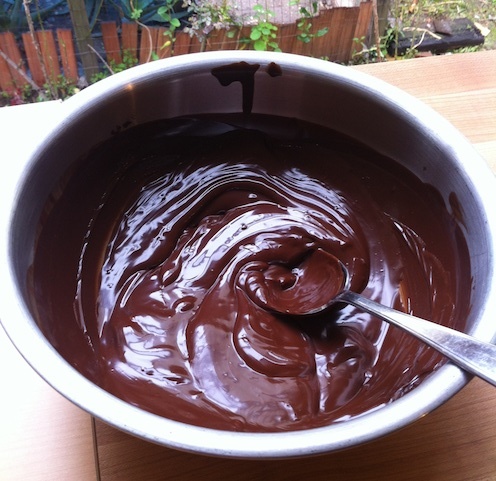 Chop the chocolate and put in a glass or metal bowl with the shortening and oil. Place bowl over a pot of simmering water and heat until the chocolate has melted (if you have a thermometer, heat to 94-104º F). Remove from heat and set aside. Preheat the oven to 350º F. Lightly butter a baking sheet and dust it with flour. Combine the water, sugar, salt, and butter in a medium saucepan. Bring to a simmer over medium heat. When the butter melts, remove the pan from the heat. Whisk in all the flour at once. Continue whisking until the dough pulls away from the pan to form a ball. Return the pan to medium heat and beat for 30 seconds to dry out the dough. Remove the pan from the heat and break in two of the eggs, one by one, whisking after each addition until smooth. In a small bowl, lightly beat the remaining egg. Whisk in as much as needed to make a dough that is very shiny and just falls from the spoon. Spoon the dough into the pastry bag and pipe into logs 4 to 5 inches long on the prepared baking sheet, spacing at least 1 1/2 inches apart. Lightly brush with the egg glaze. Bake for 25 to 30 minutes, until puffy and golden brown. Transfer the eclairs to a rack and let cool completely. Rinse the pastry bag. Remove the pastry creme and whisk until smooth. Gently cut the eclairs lengthwise almost all the way through. Fill the pastry bag with the creme and pipe into the eclairs. Heat the chocolate glaze until warm and spreadable but not runny. 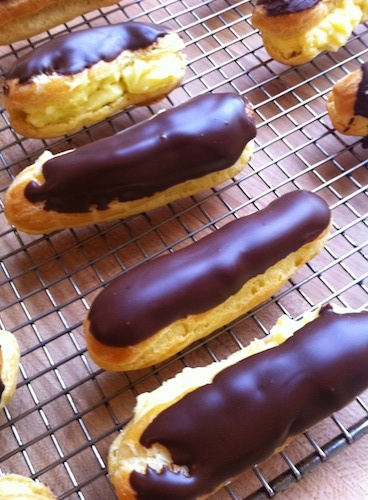 Gently dip the tops of the eclairs into the chocolate and quickly turn upright to dry on the cooling rack. This entry was posted in Not pie and tagged chocolate, eclairs, vanilla. Bookmark the permalink.